St. Samson: This holy bishop was a great champion of the Faith. He was instrumental in re-instating Judwal, the legitimate son of his murdered father, King Iona, by the usurper Conomor. In support of our Exiled Holy Father, Pope Gregory XVIII, let us pray to St. Samson to intercede on the Holy Father's behalf so that the Papal Seat may be restored, and the Church brought out of Her Exile. St. Brieuc: Originally from Wales, this saint was told by an angel to go to Brittany. St. Brieuc landed in the Cote d'Armor region of Bittany. He founded a monastery there; but he returned to Wales when he heard that a plague was killing many. His prayers stopped this plague in Wales. Let us pray to St. Brieuc to save us from the diseases that will plague mankind in the coming years. This drawing shows St. Brieuc praying at Our Lady of the Fountain, an oratory that he built with his own hands, next to a fountain of clear water which he found in southern Brittany. It is said that St. Brieuc was always aided by the Mother of God. St. Brieuc may help us find the spring of water in southern Brittany which Marie-Julie Jahenny was told will heal both body and soul after the 3 Days of Darkness. St. Corantin: We can pray to this saint to help us obtain food during the coming famine after the 3 Days of Darkness. St. Corantin's symbol is a fish. When he was a hermit, a fish appeared near his hermitage. He could cut a piece from the fish every day, and yet the fish remained whole. It is said that St. Corantin kept King Gradlon alive by feeding him from this fish. St. Malo: This saint is invoked for the cure of bodily ailments and, most importantly, for the prompt advancement in holiness. St. Malo was born in Wales; he lived as a hermit, and also sailed with St. Brandon, the great Irish saint, on apostolic voyages. He converted multiple pagans by his example and words. More miracles have been attributed to his intercession after his death than during his life. St. Patern: This saint converted pagan Irish kings. He is invoked for rain during severe droughts. St. Patern was the first bishop of Vannes. A hundred years after his death, an extended drought was killing the parishioners of Vannes. They sought recourse to their saintly bishop, Patern, and copious rain fell, saving them from the disaster. St. Tual: Also called St. Tugdal, this saint is of Welsh origin. 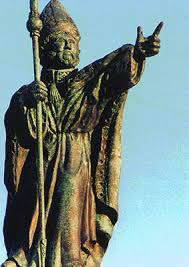 He established monasteries throughout Brittany. St. Tual is the special patron of Catholic couples who have long sought for offspring in their marriage. St. Pol of Leon: Born in Great Britain, he joined a monastery at age 9, and became a hermit at the age of 15. St. Pol was made a bishop at 22 years of age. He fought against the Pellagian heresy. Let us pray to St. Pol to help us to remain strong in the Faith and conquer all heresies. to help the Faithful to thrive in Brittany.